Featuring palm trees, toe-worthy sand, sunshine and salt air, Wrightsville Beach vacations are undoubtedly something special. With a four-mile stretch of beach, an abundance of activities, the Intracoastal Waterway, and glorious sunrises and sunsets, too, the island is a win in my family’s travel book. Since our latest family trip included grandparents, cousins and in-laws, we rented a vacation house that provided plenty of room for everyone, with an oceanfront balcony to boot. 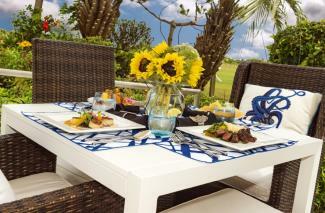 But enjoying all the island has to offer was our top priority. So our first order of business—er, vacation—was touring Wrightsville Beach. To that end, we discovered there are plenty of options. From regularly scheduled routes by land (perfect for my father-in-law) to app-scheduled boat trips (the teens were right at home pulling out their phones), we found something for everyone. After a morning swim in the ocean, we dried off and hit the Wrightsville Beach Museum of History to learn about the past of one of our favorite places. Choosing the Scavenger Hunt option for our outdoor tour, I pulled out our map and we were off. We scoured The Loop—a popular fitness trail that goes around the island—for our designated clues. During the hunt, my small group crossed paths with the rest of the clan, who took the self-guided Loop Through History Walking Tour. 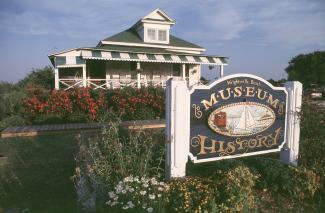 Apart from the museum, bird lovers can take seasonal Audubon North Carolina Bird Tours. Guides provide educational tidbits and spotting scopes for a first-hand look at the area’s nesting shorebirds. Spying American oystercatchers and black skimmers is common on these Monday, or by-appointment, jaunts. My brother, an avid birdwatcher, was thrilled by his experience here. Active types like me will enjoy seeing the island by bike. Several island outfitters offer beach cruiser rentals, including Aussie Island Surf Shop, so don’t fret if you left your two-wheeler at home. Walking or jogging the 2.5-mile Loop is also a treat. One morning I brought my black Lab, who especially enjoyed the park. When my family isn’t in the water we can’t wait to be on it, so a boat tour was a must. 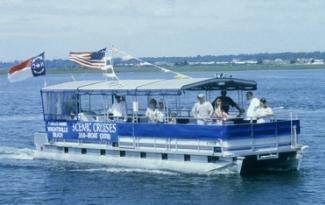 Wrightsville Beach Scenic Tours ferried us to the eco-haven that’s Masonboro Island. On our next trip my husband and I decided to take the sunset cruise. Blockade Runner Resort Coastal Adventures and Hook, Line & Paddle both offer a variety of tours to let everyone find more ways to get on the water. For the anglers—and voyagers—among us, there was Feel Good Fishing Charters & Adventures. While some in our troop say they did more lounging on the deck than casting, my husband caught dinner with the crew. Meanwhile, the rest of our pack explored the waterway by standup paddleboards, after lessons with Cape Fear Paddleboarding. Canoes and kayaks offer other satisfying ways to sightsee Wrightsville Beach. Since the area teems with fish, birds and other wildlife, a slow paddle on the surface of the water offers an up close and personal eco-adventure. Get even closer with a snorkeling or diving experience—Aquatic Safaris can help with gear rentals, charters and certification courses. For those looking to channel their inner pirate or seadog, a chartered sailboat is a memorable way to view the area’s beauty. 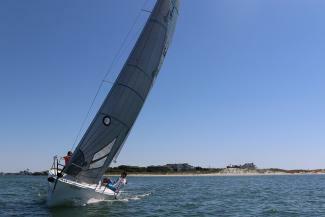 See the island with your captain from Wrightsville Performance Sailing or learn to sail yourself, under your captain’s guidance. 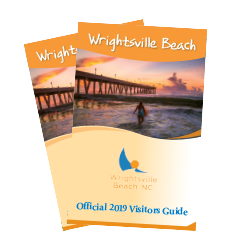 With plenty of entertainment options for all ages at Wrightsville Beach, we’ve already booked our return trip to experience more of them. The kids couldn’t get enough of the Holiday Inn Resort’s KidsClub, where they learned to surf and build colossal sandcastles. The teens enjoyed occasional breaks from the beach with rounds of basketball at Wrightsville Beach Park and watching folks reel in the big ones at Johnnie Mercer&apos;s Pier. Before the night’s dinner out, we ladies couldn’t resist a little wardrobe refresh. Our mission of finding sundresses and sandals was accomplished thanks to Hallelu Boutique, while souvenirs and extra beach gear were available in plenty at both Redix and Wings. The best part about our shopping trip was that we didn’t have to sacrifice the outdoors. Most shops are within walking distance and have an open-air flair. Meanwhile, the foodies in our family enjoyed the creative fare at EAST Oceanfront Dining, where the little ones had a variety of menu choices, as well. Another group favorite was Tower 7 Baja Mexican Grill, perfect for takeout when the restaurant was packed. When we weren’t cooking breakfast at the beach house, King Neptune proved a solid choice, easily accommodating our large and picky crew. For the music mavens in our group, acoustic tunes on the Oceanic Restaurant’s pier were a hit—along with sides of craft beer and cocktails. Next time, we have The Palm Room or Bluewater Waterfront Grill with Intracoastal Waterway views in our sights for more live music, and a stop at nearby Wrightsville Beach Brewery is on tap. This trip, though, we managed to squeeze in one more group outing before heading home the next day. With beach chairs in tow, the troops settled in for the Sounds of Summer Concert Series at Wrightsville Beach Park. Talk about going out on a high note. 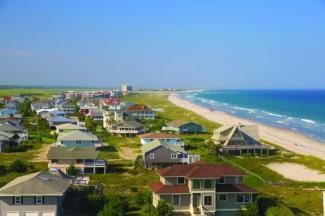 You’ll never run out of things to do in Wrightsville Beach.